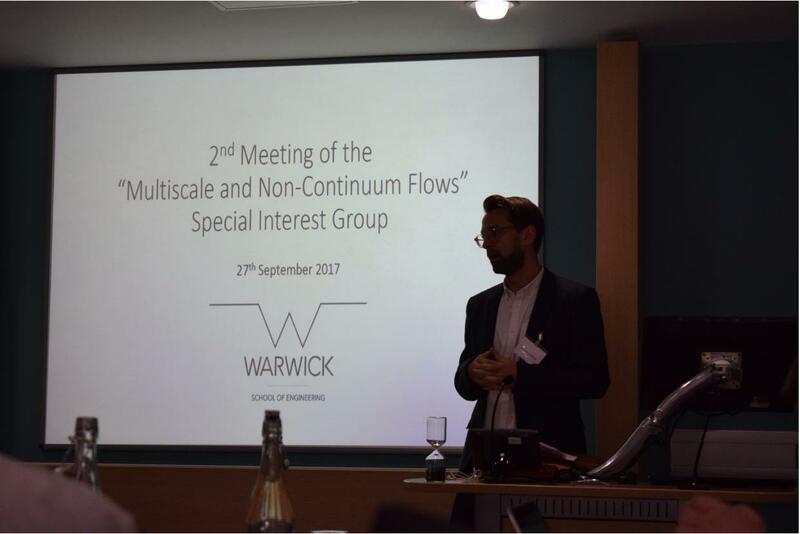 On September 27th, the second Special Interest Group (SIG) meeting was hosted at the University of Warwick. This series of meetings aims at bringing together theoreticians with experimental groups who share interest in the area of multiscale and non-continuum flows. Beside the pleasure of seeing again many members of the Micro & Nano Flows group, the meeting was a good opportunity to meet other researchers across the United Kingdom. After a welcome and 2-minute introductions by all the participants, four main lectures were given. Dr. Kislon Voitchovsky (Durham University) discussed the liquid behaviour at nanoscale interfaces both from the numerical and, even more interestingly, experimental standpoints. Dr. James Sprittles (University of Warwick) showed how non-equilibrium effects of the vapor flows can (unexpectedly) play a major role on the dynamics of the collisions between microdrops and on their impact/spreading on solid surfaces. Dr. Sergey Karabasov and Dr. Ivan Korotkin (Queen Mary University of London) presented an interesting hybrid model which smoothly combines molecular dynamics with the Landau-Lifshitz fluctuating hydrodynamics. I did appreciate the stimulating and constructive environment the meeting has created, as well as the main message of encouraging researchers to reflect on the impact that their studies may have beyond the academic community and to engage with industrial partners in collaborative research.